Musical and interactive service with Rabbi Shira and musicians Rick Recht and Aaron Shneyer. Enjoy appetizers and drinks before the 7:00 pm service. The dinner provided will be kosher; kosher supervision is provided by the Baltimore-Washington Kashrut Council. Sixth & I is able to accommodate food needs specific to vegan, vegetarian, gluten-free, and dairy-free diets. Please contact Kira at least five days before the event if you have any of these dietary requirements. 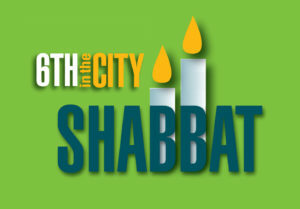 Sixth & I strives to be an accessible and welcoming resource for the community by offering affordable experiences, including Shabbat dinners. The subsidized price of $15 does not reflect the true cost of the meal provided ($30). If you are able, please consider covering the full cost of your Shabbat meal.